I have trouble opening CSV files with Microsoft Excel. Is there a quick way to fix this? Excel does not recognize the fields and displays all data in the first column. How do I set the delimiters correctly? This will tell Excel to use the ";" character as separator for the next lines. This first line is considered an instruction and not shown in your Excel sheet. When opening standard CSV (Comma Separated Values) files in Excel you may find that Excel did not recognize the fields and simply displays all data in the first column. 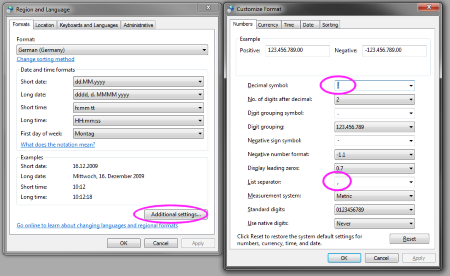 On American Windows versions, the comma is set as default for the "List Separator", which is okay for CSV files. For Decimal Symbol, enter a dot: . Now, when you open a CSV file in Excel it will automatically find the data fields and open it appropriately. at least in my reports, some columns (those that are not "RAW") employ "," for decimal ("3,45 kbit/s)"; so when you replace "," with ";" you get a somewhat ugly result ("3;45 kbit/s"). Problem is that (at least with my settings) RAW columns and "formatted" columns have different symbols for decimal and third digit symbols. I'm afraid only 1 and 3 would work without further editing. Great. The only reason I signed up for this site is to give a upvote to the "Fourth solution", but the site is telling me I need more points for that. The "Fourth solution" works! And it is so simple and it works with a little change. I downloaded a CSV spreadsheet from the US and tried to open it with my MS Excel 2010. It did not work. Solution #2 did not work for me, too. The semicolon was only intended as example and can be replaced by any character being the real separation character in your CSV file. I'm glad this worked for you. None of these solutions work for me, and the "best" solution is not a good solution at all as it only works with Excel, and no product that generates a csv will add that line to the front. I have a US version of Windows in the USA, and my control panel Regions and Language settings already have the decimal point as (.) and list separator as (,). My CSV has commas to separate fields (it was generated by SQL Server Management Studio) and still imports to Excel all in the first column. In addition, some of the lines are long enough that Excel wraps them into two rows. The fourth solution would be fine, except that it is not allowed when the file starts with a ByteOrderMark (BOM) to indicate the file contains UTF-8. Is there a way to use both features? In addition to Solution #3, also ensure that "Use system separators" is checked under Advanced setting. Make sure "Use system separators" is checked. For me, this setting was not checked. 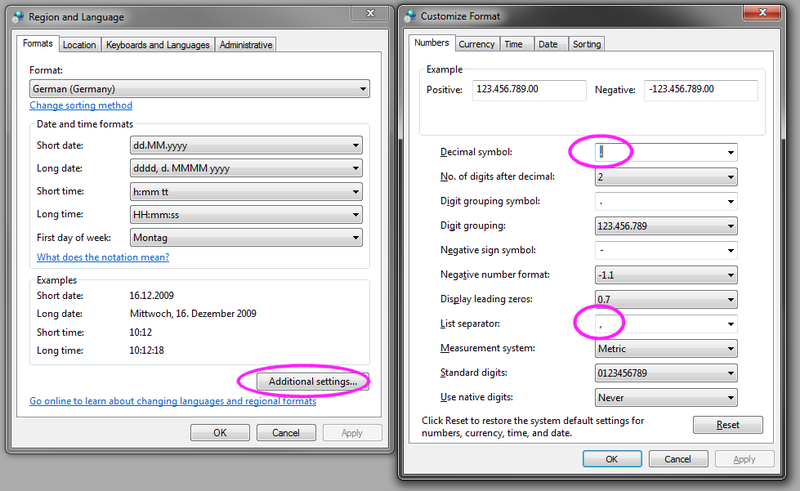 After checking this setting I am able to view csv file.